Turkish desserts are not normally my thing: on the whole they are just too calorific for me to have even the remotest desire to make them! I would say that baklava is probably the best-known Turkish or Middle Eastern dessert but when there are specialist baklava shops in many neighbourhoods, I ask myself why would I ever want to make it? When I have visitors from abroad, I take myself round the corner to a small branch of Güllüoğlu and buy a selection of the choicest walnut or pistachio-filled treats that you can imagine. All the classics are readily available: they are all scrumptious, I am not disputing that, but not a good idea to have in your home on a regular basis. last week I had a special request for a Turkish dessert. This was from an American family who were visiting family members currently residing in Istanbul who wanted to spend a few hours cooking together. Fortuitously, they were put in touch with me! Many of you, well those of you on facebook, know that I now have a new string to my bow: cooking classes! It’s all very exciting and I am lucky enough to have the use of a great kitchen in an old historical building in Kuzguncuk, which is a wonderful traditional part of the city. It’s perhaps not quite as convenient as cooking in your own kitchen where you know where every last spatula is, but on the other hand, the pluses are great: a super space in wonderful, warm colours with a huge table and a terrace with views of the Bosphorus to die for. 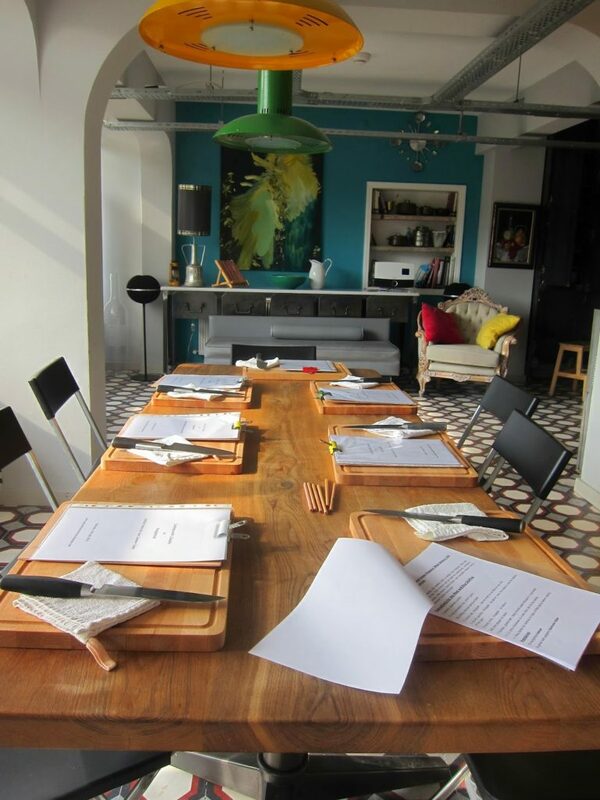 And it is very well-equipped as it is the kitchen of popular chef Refika Birgül! Her weekly TV shows are filmed right here in this kitchen! So I consider myself privileged to be able to use it. Among the classic Turkish desserts that I do in fact make are ayva tatlısı or quince dessert, and kabak tatlısı/pumpkin dessert, but the fact of the matter is that neither of these is in season right now. So I thought long and hard about what to make. 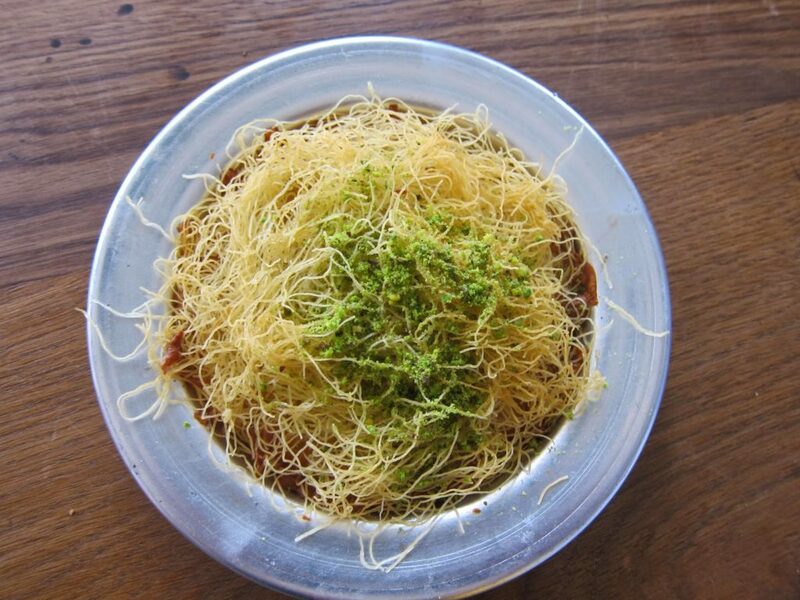 The idea of künefe came to me as I relived my foodie walks in Eminönü: which dessert was unusual in itself with unusual ingredients, and at the same time quite a little showstopper? 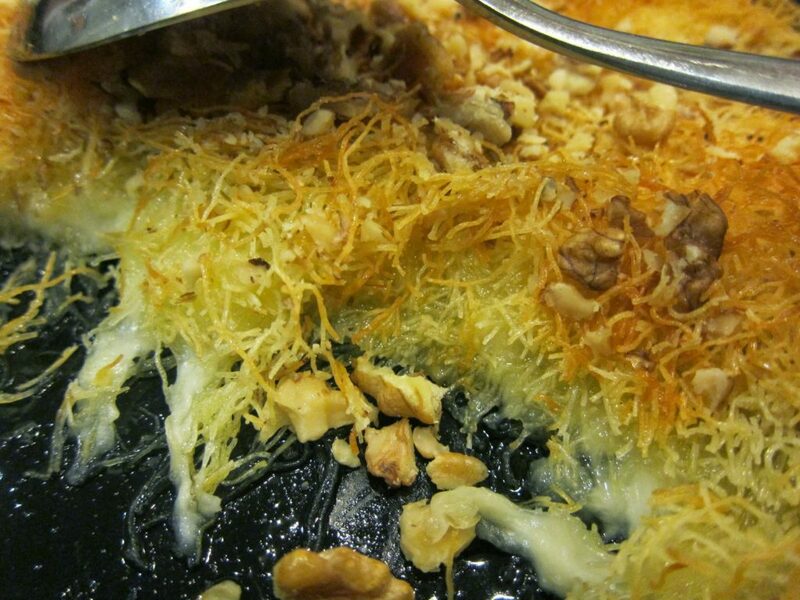 Künefe‘s main ingredient is commonly described amongst the foreigners as ‘shredded wheat’. It is made from yufka dough which has been put through a sieve resulting in fine, long strands and called tel kadayıf/ ‘wire’ pastry strands. 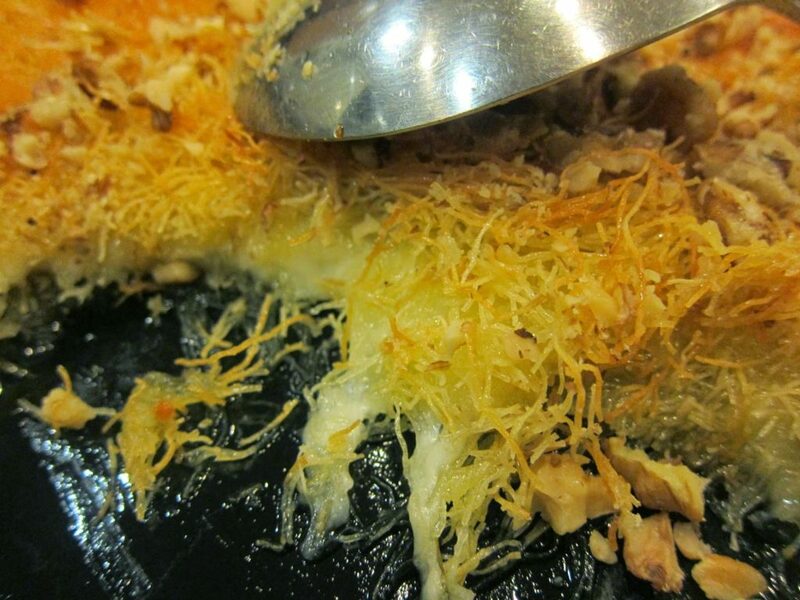 Two desserts are commonly made with it, one simply called kadayıf with walnuts, and the other künefe with a meltingly soft cheese sandwiched between 2 layers of heavily buttered pastry strands. As it comes out of the oven, a syrup is poured over it. Can you imagine the result? The seductive oozing of the cheese as you cut into it with a fork, warm with the sweetness of the syrup and the final OMG touch of ground pistachio nuts sprinkled on top? You will need 6 small ovenproof dishes or 1 large one. 250g/8oz unsalted cheese, grated, eg mozarella, ricotta or any melting cheese. I used dil peyniri. You could use lor too. Place the sugar and water in a pan and simmer uncovered over a low heat for about 15 minutes. Add the lemon juice, heat through and then remove from the heat. Set aside to cool. Place the pastry strands in a bowl and separate them out. Pour the melted butter over. Using your hands, mix it well so that the strands are well soaked. Use more butter if necessary. Divide the strands into two (or 6 if using small dishes). Place one half in the dish and spread out all the way to the sides. At the same time, rub it around the dish so the base is greased. Press down. 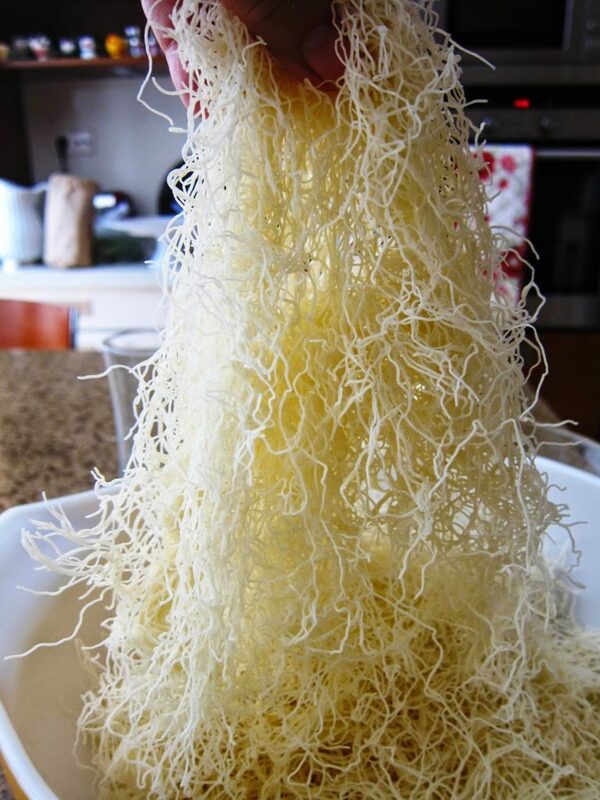 Sprinkle the grated cheese evenly over the kadayıf and then cover with the remaining half. Press firmly down. TIP If you wish to make this in advance, cover with 2 layers of cling film and refrigerate till needed. Otherwise, place in the preheated oven for about 40 minutes or until a deep golden colour. (If using smaller dishes, keep your eye on them to make sure they don’t burn). Pour the prepared syrup over it and sprinkle with the ground pistachio nuts. Serve warm or hot while the cheese is still gooey! 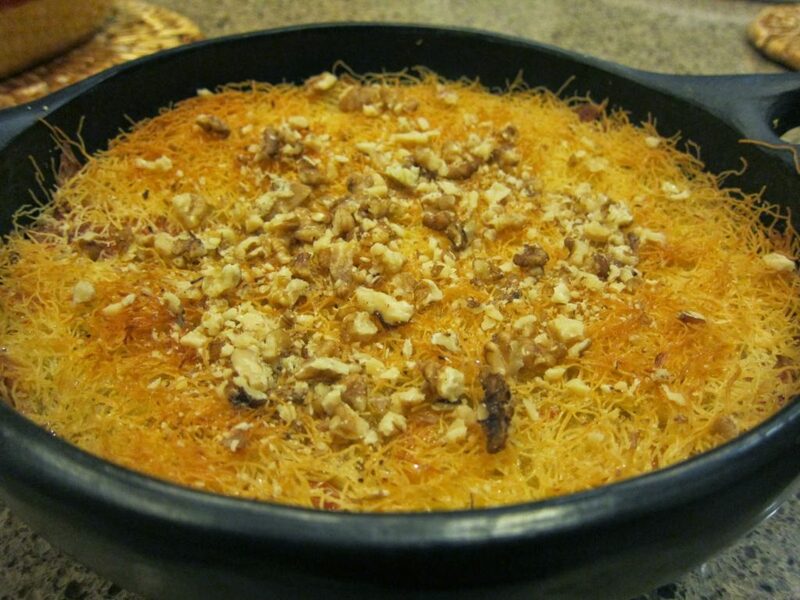 TIP: The first time I made künefe, I used a large dish. In the class, I used 6 small, traditional künefe dishes which Refika kindly offered me. The larger size worked better I think because it was easier to divide up the pastry strands into 2 lots as opposed to 6 and then halve each. I now see that it is important to make sure that the base of the dish is indeed well-buttered AND that the cheesy layer is covered all over with the strands otherwise everything sticks. Not that the taste is impaired in any way! Further tip: I think the little dishes are probably too much of a good thing which makes the large dish easier to serve a spoonful each. BTW this dish is not nearly so good if served later: the cheese hardens and you don’t get the same melt-in-your-mouth sweet sensation! Previous Post: « Roasted White Eggplant/Beyaz Patlıcan, Sliced, Stuffed with Cheese, Tomato & Fresh Herbs!